We left the Baltic States through the narrow passage (approximately 80 km. wide) between Kaliningrad and Belarus, both of which belong to Russia and require a visa to enter (our Russian visas expired three weeks ago). This led us into Poland. 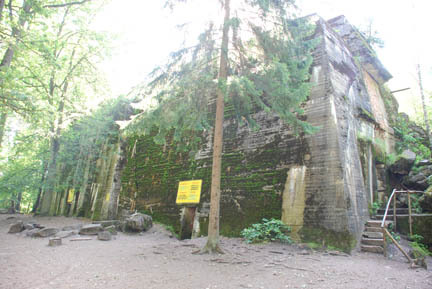 Our first stop was at Wolfsschanze (Wolf's Lair), Hitler's headquarters during his Russian campaign and his main residence from 1941 to 1944. It was here that Colonel Klaus von Stauffenburg tried to assassinate Hitler during a regular staff meeting. He brought a briefcase bomb into the meeting, left it by Hitler and went to answer a pre-arranged phone call. Another officer, not in on the plan, moved the briefcase. Hitler was only wounded although several others died. The colonel was executed along with 5,000 others Hitler claimed were in on the plot. This is one of the bunkers for the officers living there. Hitler had one all to himself. The area had a lot of buildings, all out of brick or concrete. The living quarters were the huge bunkers and office spaces were brick. 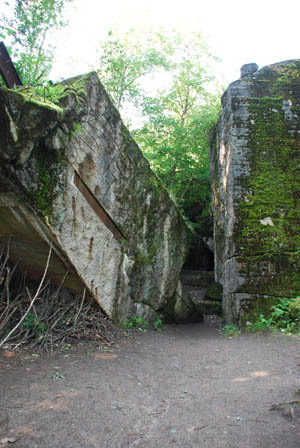 There were also shelters underground and a railroad line to a nearby airport. The site had several hundred people at it. All of this was under camouflage netting. When the Russians got close to here the buildings and bunkers were loaded with tons of high explosives. When the site was abandoned, they detonated the explosives and destroyed the site. The angled slab of concrete is the roof of a bunker, almost 20 feet thick that came down when the wall went outward. Today the site is badly overgrown with brush and small trees. It is possible to tell which trees were there in WW II because of the size difference but the area between them is filled with smaller trees and brush that block viewing of the ruins except where visitors have kept it open. 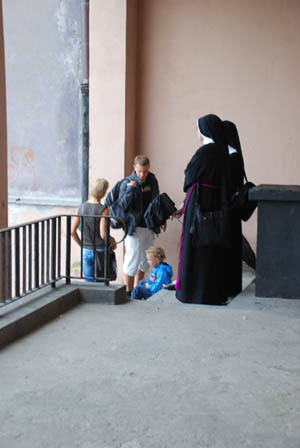 After an hour looking at the broken blocks of concrete we had had enough and went on to Warsaw. Warsaw was completely destroyed in WW II and was rebuilt in the original model. This is the city hall square (even if it is triangular). The weather was rain showers and dry times. We didn't bring our rain jackets so we took shelter on a porch with two nuns and a young family until it that shower was over. 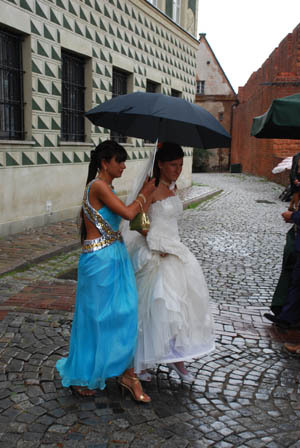 We also saw this wedding party with the bridesmaid holding the umbrella as they went to the old (newly rebuilt) city gate for a photo session. On August 1st of 1944 the Poles had had enough of German occupation and rose up against them. The Polish army was a division of the Red army and with them were many citizens. They had some armament but it was of poor quality. They were up against hardened troops with much better arms. It was rocks and rifles against tanks and machine guns. On September 14th there were 40,000 Polish insurgents and 180 citizens killed as well as 25,000 Germans dead or wounded. The Red Army was across the river at the edge of the city but did not come to the assistance of the Poles. The monument represents the insurrection with a man coming out of a manhole on the right, a woman with a child on the left and a group of soldiers coming from under the concrete blocks in the rear. 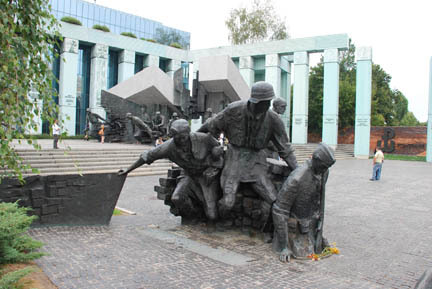 It is very poignant and represents a sad chapter in Poland's history. From here it is a one-day run to Berlin.